Elected by default, Macron's administration was supposed to be a new broom to break the mold and change what previous administrations had not dared to, but now we see how fragile political system is, professor John Laughland said. Students are back out on the streets of France protesting against the government's education reforms, forcing over 150 schools to close, with some demonstrations turning violent in a number of cities. This comes as the French government scraps a fuel tax hike after weeks of mass protests against the issue. Meanwhile, French government spokesman Benjamin Griveaux warned about provocateurs saying that "radicalized elements try to exploit the movement" in order to "overthrow the authorities." 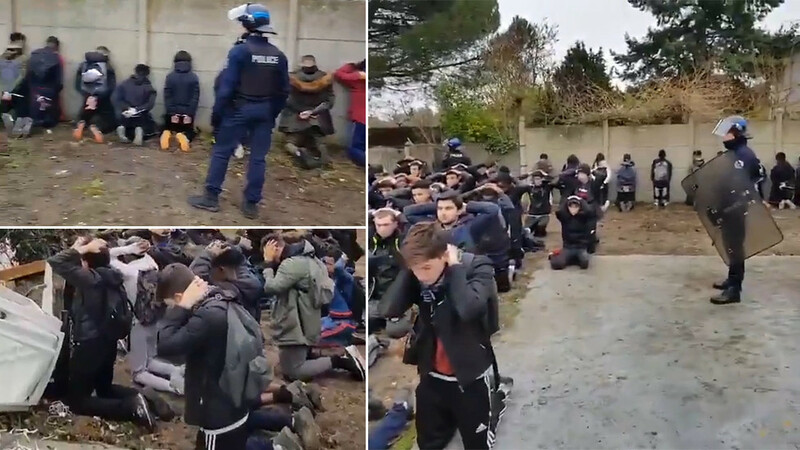 The controversial video from Mantes-la-Jolie released late Thursday has been a hot topic of discussion on social media. Depicting rows of education reform protesters on their knees, hands on heads, with helmeted police officers, it gathered thousands of retweets and angry comments. Many users compared the manner the officers were handling the arrestees with execution by firing squad. On Friday morning, French Education Minister Jean-Michel Blanquer was asked by France Inter radio to give his opinion on the video. By “climate of exceptional violence” he was referring to Yellow Vest protests that have been gripping the nation for the third consecutive week. Big rallies are expected this Saturday and authorities are gathering re-enforcements in the face of 89,000 police officers and armored vehicles belonging to Gendarmerie, the country’s military police. Blanquer called upon those who react to the footage to analyze the situation in this context. “What happened? There are those who don’t attend these high schools, they are more than 20 years old … and they manage to gather students [in these schools],” he said. These very people attacked police officers, who tried to neutralize them and line them up against a wall, he added. The minister insisted that it was “a miracle” that Mantes-la-Jolie clashes didn’t result in any deaths. Meanwhile, the Yellow Vest rallies that gripped the nation last Saturday turned violent, resulting in the deaths of four people. Thursday’s clashes resulted in 153 arrests and most of them were students. Similar clashes happened across the whole of France, and as of Friday some 700 high schools across the country were disturbed by protests and 400 of them were closed.